The Society of Friends answer to the question, How can a free fellowship based on Divine guidance from within set up any form of church government providing direction from without? Howard Brinton taught at half a dozen institutions, including such Quaker centers as Haverford, Guilford, Earlham and Woodbrooke. The last of these four provided a model for Pendle Hill. He also worked overseas in Japan and Europe for the American Friends Service Committee. Between 1936 and 1950, he served as director of Pendle Hill, sharing that job with his wife, Anna Brinton. The Brintons first came to Pendle Hill in 1936, where they faced the contingencies of a pioneer school-community. All sorts of odd jobs, which a maintenance crew might later handle, fell to the Director of Studies. Howard Brinton was frequently seen traipsing across campus on his way to negotiate the latest crisis, pursued by his rabbit Tibbar and the family dog Nuto. Gerald Heard, then a member of the Pendle Hill staff, watched this peaceable kingdom on the march with delight and saw in it a practical illustration of the philosophy of survival by reconciliation. In addition to writing more than a dozen Pendle Hill pamphlets, Howard Brinton wrote Friends for Three Hundred Years, a classic work of Quaker faith and history. 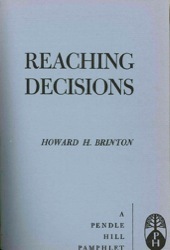 Howard Brinton died in 1973.